For the video game, see Sadness (video game). "Sad" redirects here. For other uses, see Sad (disambiguation). A detail of the 1672 sculpture Entombment of Christ, showing Mary Magdalene crying. Sadness (also called heavy-heartedness) is emotional pain associated with, or characterized by feelings of disadvantage, loss, despair, grief, helplessness, disappointment and sorrow. An individual experiencing sadness may become quiet or lethargic, and withdraw themselves from others. An example of severe sadness is depression. Crying is often an indication of sadness. Sadness is one of the "six basic emotions" described by Paul Ekman, along with happiness, anger, surprise, fear and disgust. Sadness is a common experience in childhood. Acknowledging such emotions can make it much easier for families to address more serious emotional problems, although some families may have a (conscious or unconscious) rule that sadness is "not allowed". Robin Skynner has suggested that this may cause problems, because with sadness "screened-off" we are left a bit shallow and manic. Sadness is part of the normal process of the child separating from an early symbiosis with the mother and becoming more independent. Every time a child separates just a tiny bit more, he or she will have to cope with a small loss. If the mother cannot allow the minor distress involved, the child may never learn how to deal with sadness by themselves. Pediatrician T. Berry Brazelton argues that too much cheering a child up devalues the emotion of sadness for them; and Selma Fraiberg suggests that it is important to respect a child's right to experience a loss fully and deeply. Margaret Mahler also saw the ability to feel sadness as an emotional achievement, as opposed for example to warding it off through restless hyperactivity. D. W. Winnicott similarly saw in sad crying the psychological root of valuable musical experiences in later life. According to the American Journal of Psychiatry, sadness was found to be associated with "increases in bilateral activity within the vicinity of the middle and posterior temporal cortex, lateral cerebellum, cerebellar vermis, midbrain, putamen, and caudate." Jose V. Pardo has his M.D and Ph.D and leads a research program in cognitive neuroscience. Using positron emission tomography (PET) Pardo and his colleagues were able to provoke sadness among seven normal men and women by asking them to think about sad things. They observed increased brain activity in the bilateral inferior and orbitofrontal cortex. In a study that induced sadness in subjects by showing emotional film clips, the feeling was correlated with significant increases in regional brain activity, especially in the prefrontal cortex, in the region called Brodmann's area 9, and the thalamus. A significant increase in activity was also observed in the bilateral anterior temporal structures. People deal with sadness in different ways, and it is an important emotion because it helps to motivate people to deal with their situation. Some coping mechanisms could include: getting social support and/or spending time with a pet, creating a list, or engaging in some activity to express sadness. Some individuals, when feeling sad, may exclude themselves from a social setting, so as to take the time to recover from the feeling. While being one of the moods people most want to shake, sadness can sometimes be perpetuated by the very coping strategies chosen, such as ruminating, "drowning one's sorrows", or permanently isolating oneself. As alternative ways of coping with sadness to the above, cognitive behavioral therapy suggests instead either challenging one's negative thoughts, or scheduling some positive event as a distraction. Being attentive to, and patient with, one's sadness may also be a way for people to learn through solitude; while emotional support to help people stay with their sadness can be further helpful. Such an approach is fueled by the underlying belief that loss (when felt wholeheartedly) can lead to a new sense of aliveness, and to a re-engagement with the outside world. Pupil size may be an indicator of sadness. A sad facial expression with small pupils is judged to be more intensely sad as the pupil size decreases. A person's own pupil size also mirrors this and becomes smaller when viewing sad faces with small pupils. No parallel effect exists when people look at neutral, happy or angry expressions. The greater degree to which a person's pupils mirror another predicts a person's greater score on empathy. However, in disorders such as autism and psychopathy facial expressions that represent sadness may be subtle, which may show a need for a more non-linguistic situation to affect their level of empathy. 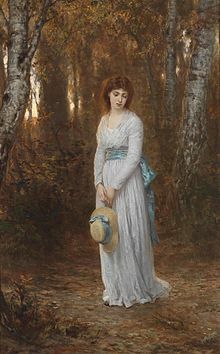 Lost in thoughts, by Wilhelm Amberg. An individual experiencing sadness may become quiet or lethargic, and withdraw themselves from others. During the Renaissance, Edmund Spenser in The Faerie Queene endorsed sadness as a marker of spiritual commitment. In The Lord of the Rings, sadness is distinguished from unhappiness, to exemplify J. R. R. Tolkien's preference for a sad, but settled determination, as opposed to what he saw as the shallower temptations of either despair or hope. Julia Kristeva considered that "a diversification of moods, variety in sadness, refinement in sorrow or mourning are the imprint of a humanity that is surely not triumphant but subtle, ready to fight and creative". Look up sadness in Wiktionary, the free dictionary. 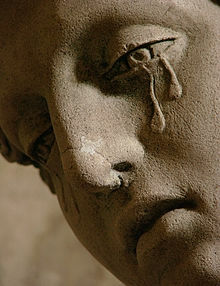 Wikimedia Commons has media related to Sadness. ^ Masman, Karen (2010). The Uses of Sadness: Why Feeling Sad Is No Reason Not to Be Happy. Allen & Unwin. p. 8. ISBN 9781741757576. ^ Ahern, G.L., Davidson, R.J., Lane, R.D., Reiman, E.M., Schwartz, G.E. (1997). Neuroanatomical Correlates of Happiness, Sadness, and Disgust. The American Journal of Psychiatry, 926-933. ^ Bos, E.H.; Snippe, E.; de Jonge, P.; Jeronimus, B.F. (2016). "Preserving Subjective Wellbeing in the Face of Psychopathology: Buffering Effects of Personal Strengths and Resources". Plos One. doi:10.1371/journal.pone.0150867. ^ "Pupillary contagion: central mechanisms engaged in sadness processing". U.S. National Library of Medicine. Retrieved 24 January 2016. ^ Harrison NA, Singer T, Rotshtein P, Dolan RJ, Critchley HD (June 2006). "Pupillary contagion: central mechanisms engaged in sadness processing". Soc Cogn Affect Neurosci 1 (1): 5–17. doi:10.1093/scan/nsl006. PMC 1716019. PMID 17186063. ^ a b Harrison NA, Wilson CE, Critchley HD (November 2007). "Processing of observed pupil size modulates perception of sadness and predicts empathy". Emotion 7 (4): 724–9. doi:10.1037/1528-3542.7.4.724. PMID 18039039. Karp DA (1997). Speaking of Sadness. ISBN 0195113861. Keltner D, Ellsworth PC, Edwards K (May 1993). "Beyond simple pessimism: effects of sadness and anger on social perception". J Pers Soc Psychol 64 (5): 740–52. doi:10.1037/0022-3514.64.5.740. PMID 8505705. Tiedens LZ (January 2001). "Anger and advancement versus sadness and subjugation: the effect of negative emotion expressions on social status conferral". J Pers Soc Psychol 80 (1): 86–94. doi:10.1037/0022-3514.80.1.86. PMID 11195894. Forgas JP (March 1998). "On feeling good and getting your way: mood effects on negotiator cognition and bargaining strategies". J Pers Soc Psychol 74 (3): 565–77. doi:10.1037/0022-3514.74.3.565. PMID 11407408. Forgas JP (August 1998). "On being happy and mistaken: mood effects on the fundamental attribution error". J Pers Soc Psychol 75 (2): 318–31. doi:10.1037/0022-3514.75.2.318. PMID 9731311. Forgas JP (1994). "The role of emotion in social judgments: an introductory review and an Affect Infusion Model (AIM)". Eur J Soc Psychol 24 (1): 1–24. doi:10.1002/ejsp.2420240102. Forgas JP, Bower GH (July 1987). "Mood effects on person-perception judgments". J Pers Soc Psychol 53 (1): 53–60. doi:10.1037/0022-3514.53.1.53. PMID 3612493. Isen AM, Daubman KA, Nowicki GP (June 1987). "Positive affect facilitates creative problem solving". J Pers Soc Psychol 52 (6): 1122–31. doi:10.1037/0022-3514.52.6.1122. PMID 3598858. Keltner D, Kring AM (1998). "Emotion, social function, and psychopathology" (PDF). Review of General Psychology 2 (3): 320–342. doi:10.1037/1089-2680.2.3.320. This page was last modified on 20 March 2016, at 23:49.